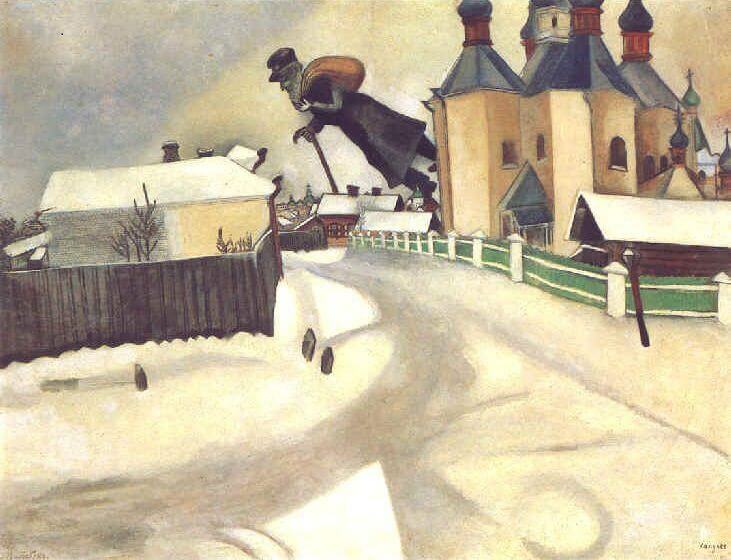 Over Vitebsk belongs to a large series of works that the artist began after his return to his hometown in June 1914, which take as their subject an over-life-size, elderly beggar floating above the snow-laden rooftops of Vitebsk. 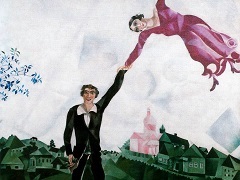 The painting plays on the Yiddish expression for a beggar moving from door to door, "er geyt iber di hayzer", which translates as "he walks over the houses." 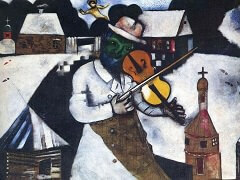 This whimsical turn of phrase allowed Chagall to transform an otherwise naturalistically rendered scene of Vitebsk in winter through the addition of a strange airborne character with a sack on his back, whose presence imbues the composition with a dreamlike otherworldliness. 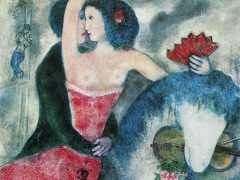 If Chagall left Russia physically to live in Paris, he never did so emotionally or spiritually: Vitebsk figures in much of the work he created in France. His distance from family and Bella Rosenfeld, who would eventually become his wife, undoubtedly fed his fondness for his home town. 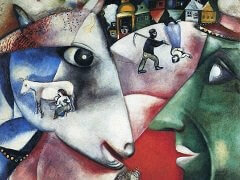 Indeed, Chagall's sense of self was so rooted there that he would come to consider Paris his "second Vitebsk." This may sound like the mooning of a romantic and homesick artist. Yet looking at Over Vitebsk or The Flying Carriage (1913), one gets such a particular feeling of the place - where magical events are as prosaic as milking the cow - that it's impossible not to feel bewitched by them. 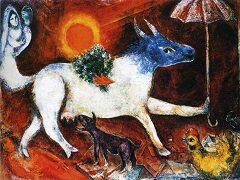 Chagall is the rare sophisticate who manages to tap into the emotional sturdiness of folk culture without belittling or, at least in these paintings, over-sentimentalizing it. As an artist he was a product of both modernist Paris and the shtetl, a hybrid of the urban and the rural, the new and the old. This is what makes his best work compassionately earthy and utterly fantastic. 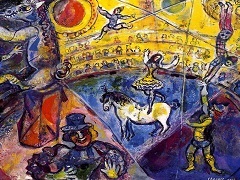 It is what makes Chagall Chagall.